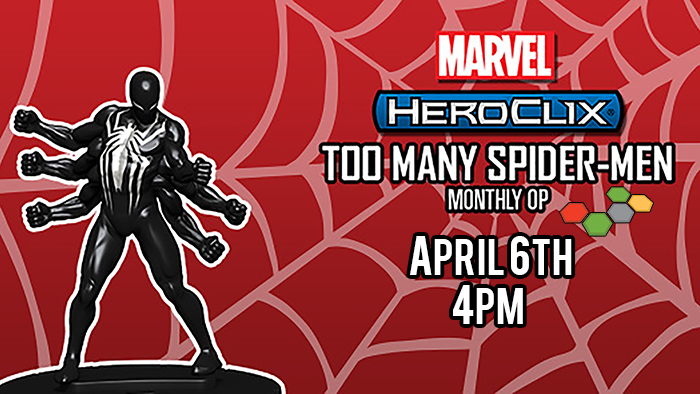 Monthly Heroclix tournaments are on the menu! Bring your best to get your fill, and get some great prizes along the way! This month is Too Many Spider-Men and Earth X OP kits! First place receives a LE Scarlet Spider #100 and Ai Apaec, second receives a LE Scarlet Spider #100 and Scarlet Spider, and Fellowship will receive a LE Scarlet Spider #100 and Spider-Man. Top finishers will receive store credit based on attendance as well, and there will also be five maps up for grabs from the Earth X OP Kit! $10 gets you into a 300pt Modern Age tournament with Swiss rounds based on attendance.